I forgot my early 76 is a Canadian model too... series 2A? IMO, since Series One and Two seems to be virtually useless when trying to pin down what parts the car was built with, I humbly suggest that the year and early or late as a designation would be better. It works for most of the years and better describes the build. I wonder if the original owners of both your cars simply bought aftermarket A/R bars from the same mail order operation. 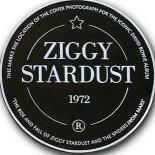 You've reminded me of the two big sportscar accessory shops in Toronto back in the 1970's. One was called Piranha Motorsports . The other was R&R, or something like that. Both benefited from large sums of hard-earned money I pushed across their counters. I've also done some customization work to my 77. Zkars: if both of your new cars have no-emmisions stuff including no air pump I would say they are a UN not a UA. Did anyone mention the "NISSAN 2400 OHC" rocker cover and hand throttle yet? I know this is hard to believe but HS30-00352 isn't far from finally being driven again. SHOCK HORROR!!! Rear brake wheel cylinders. Series I costs ~$200 US where Series II can be had for <$40 US. Guess which way I went on my Series I? An interesting note on my Series I car. It came with the Series II map light bezel (the one with the hood). what about resin sugar scoops, plastic evap tank in the rear? We should use the term early cars and late cars. I don't really get the confusion with the series one designation. It's a made up term to identify cars with certain features, built in a certain time frame. IMO the set in stone features of the series one cars are the hatch vents, '240z' badges on the C pillar, and lack of integrated storage/tool bins, and maybe a few other features like the solid spoke steering wheel. There were many changes within the range that series one cars were built, I don't think that negates the function or usefulness of the term. IMO the set in stone features of the series one cars are the hatch vents, '240z' badges on the C pillar, and lack of integrated storage/tool bins, and maybe a few other features like the solid spoke steering wheel. I'd agree with this. It is kind of fun to note all the small changes that were phased in though. Porsche did the same thing on their 930 series I cars from 75 through 77. Within that series they changed from 15 to 16 inch wheels and went to power assisted brakes in the last year of the series I cars. Series II in 78 added the intercooler, went to a 3.2 liter motor and changed the whale tail to house the intercooler. This was in a much smaller group, I think there were just under 2,900 cars in the 3 years of the first series 930's. I don't really get the confusion with the series one designation. It's a made up term to identify cars with certain features, built in a certain time frame. The main problem is that people use the term inaccurately, and apply it to details and features which don't fall neatly into such pigeonholing. I agree with rturbo. I have a 5/71 and there are a lot of similarities. Grease reservoir in the steering rack, type b transmission tunnel, series 1 console, choke, radio, e31 head. I would pay attention to the radio, console & choke, b-pillar emblems, rear deck vents, rear deck window, tool boxes, seat hardware, steering wheel, and the elusive hand throttle. I thought only a select few of the early models had the 2400 valve cover. OK, a somewhat rhetorical question here: To what exact model(s) and/or sub-variants does the 'Series One' moniker actually apply? Surely the fact there's no clear cut off or a factory change, just shows it will not work as a 'series' descriptor. I'm far from an expert, from what I've seen, read, it was all a gradual change with little bits changed during the production run. Thats why early/late works as a descriptor. Its seems to be a constant evolution. Early/late is too vague. Without context, it could mean anything. To simply say you have an 'early' Z could mean anything. It could mean any 240z, any series one 240z, any 1970 series one car built early in the year, or any series one car with a 1969 build date. In the context of 1969 build date cars, it could even mean only very early build date 1969 production cars. When you refer to a Z as a series one, most people who have been around here for a minute know exactly what you're talking about. And I would argue that there is a clear cut off. For US cars, VINs under, I believe, about 20500, build dates up to 1/71 - although recently there was a late production series one car that had a 2/71 build date, but that is an anomaly, and I've never seen such a thing. It works just fine as a 'series' descriptor, has for many years. I certainly wouldn't consider myself an authority on the matter, but I think my definition of a series one car is pretty accurate. It is not meant to apply to cars with an exact selection of parts. Also, I would only apply it to US models. I don't know the non-US Z market that well, so maybe it could apply to cars outside of the US market, but I am assuming that the term originated in the US, and is best applied to US market cars. Someone else can chime in if they feel differently. There's been a 3/71 build car that's an early body and none vented quarters. Your statement is a contradiction, there's no clear cut off, not a documented one, not one that in 40odd years people have managed to put a date/build number to. If so it would be easy and factory correct. You can apply early to just about any world market based on the body? I said about 20500 because I don't recall the exact number. It's not like there's a few series one cars with VINs 21000 and up. They are ALL under a certain VIN. As for build dates, most VINs correlate with a certain build month, but every so often there is an outlier, I would assume due to some sort of issue or event at the factory. If I am not mistaken, VINs were applied to shells in order, and date stamps were done as they were completed (can someone confirm/expand on that? ), so if one shell gets held up for some reason, it will end up with a later build date. I am stretching my memory here, but that is my understanding of VIN/build date mismatches based on what I've read over the last decade. And once again, I am referring to the US market cars. I am not sure which part of my post you're referring to with your last sentence. I am only talking about US market cars. I think you are trying to apply an overly specific definition to the term "series one." 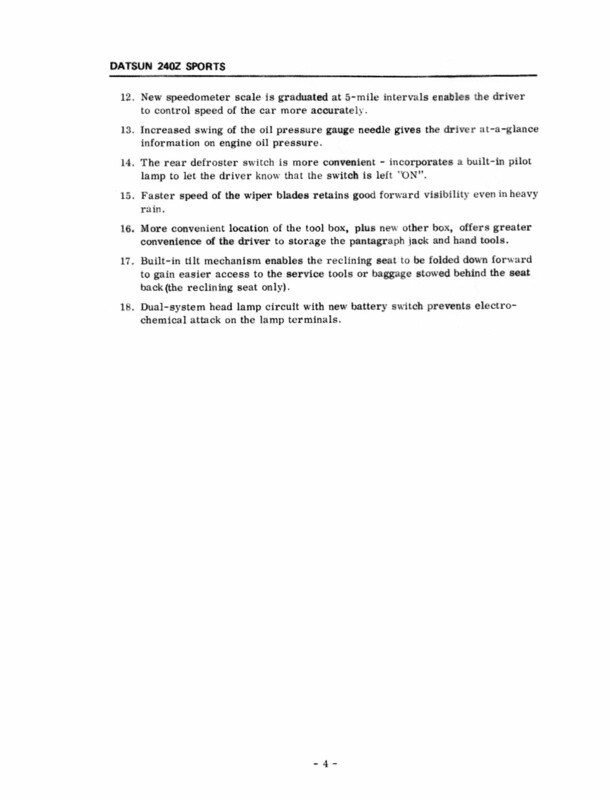 As previously stated, it is not meant to apply to an exact selection of parts and features. And to be honest, I'm not sure if it really needs to have an exact VIN or build date cut off to be of use, even though I still maintain that there IS a VIN cut off, and save for a few outliers (actually just one that I know of), a build date cut off. Also, due to the fact that these cars are old, and many have been lost, we probably won't ever know the exact VIN cut off. Based on the information on zhome.com, the last reported series one car has VIN 20438, and the first series two car has VIN 21001, with the change over month being January 1971. As mentioned above - An attempt to keep things clear and simple; when Nissan sold one Model 240Z as both 1970 and 1971 Model Year 240Z's. Then introduced a second Model and sold it as a 1971 240Z. (aka “Late Model Year 1971”). Since two different looking models were sold as 1971 240Z’s - people wanted to know which 1971 Model Year was being discussed or sold or possibly being purchased. Early and Late in terms of calendar months or years - - really wouldn’t do - because the Series I 240Z’s were produced from Oct. 1969 - - - clear though Jan. 1971. Covering 3 calendar years - late in 1969, early in 1970, late in 1970 and early again in 1971. Series I and Series II simply give a distinct definition for identification. 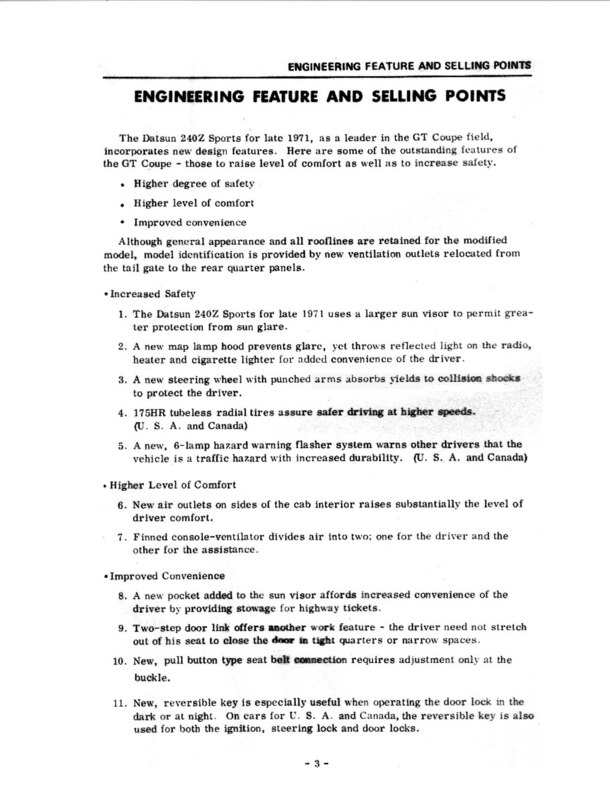 As to specifically which parts, components and features changed on the Series II 240Z’s - Nissan outlines some 18 Safety, Comfort and Convenience features - that were added or changed in the Series II (aka Late Model Year 1971’s). None of which were standard equipment on the Series I. All of which were introduced with the production of the Series II. See: SERVICE BULLETIN, February 1971, Vol. 137. 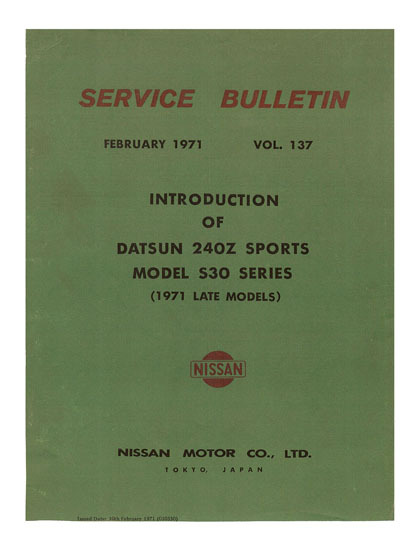 “Introduction Of Datsun 240Z Sports, Model S30 Series (1971 Late Models). Pages 3 & 4. (URL’s below). To distinctly identify the new Model - Nissan assigned VIN’s starting at HLS30 21001. (again in the same Factory Service Bulletin) Past Series I and Series II - Nissan never sold the same model as more than one Model Year again here in the USA. All 72 & 73 Models were sold only as 1972 or 1973 Models. Although significant changes were introduced on each Model Year there was no real need to use Series designations for them. I came across that problem last time when one of my cylinders was stuck from sitting in the winter and was leaking fluid. I managed to get only a new cup seal ( few dollars ) and rebuild the unit, or else it would cost me that 200 + USD..
"Comfort and Convenience features - that were added or changed in the Series II"
"A new pocket added to the sun visor affords increased convenience of the driver by providing storage for highway tickets."